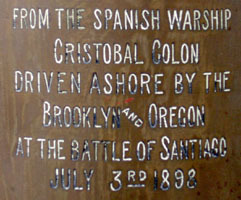 Below are photos of a 6 inch shell casing from the Spanish Cruiser CRISTOBAL COLON. The 6" shell casing from the CRISTOBAL COLON (left) beside a 57mm "6 pounder" shell casing of the same period. As she was not carrying her intended two 10" main guns, the primary armament of the CRISTOBAL COLON were her ten medium 6" (16 cm) Armstrong guns located her hull. These weapons used smokeless powder, a change in technology which incoming at the time of the war. These guns were “quick-firers”, that is, they used cased propellants - shells - rather than powder bags in the loading operation. The weapons used semi-fixed ammunition - ammunition in which the projectile was not attached to the shell casing, with the projectile being loaded first and the casing placed in behind it. The case here pictured is a trophy of war. It is not known whether this case was fired or later emptied of contents, including the removal of the primer which screwed into the base. The CRISTOBAL COLON was engaged until it broke away from the battle, it’s guns contributing flash but little smoke to the battle. 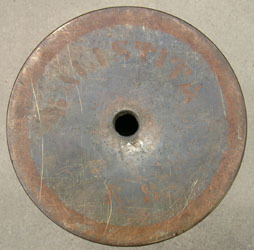 The word “BALISTITA” is stenciled onto the bottom of the base in 5/8" letters. This word is Spanish for "ballistite," a form of nitrocellulose smokeless powder. Additionally stenciled are what appears to be “K 8" as well as a ½" painted ring around the bottom of the rim. The current rust color of the paint may have changed with time. In addition to the stencils are the stampings “EOC” in overlapping letters and “2/97". The EOC stands for “Elswick Ordnance Company” (the ordnance manufacturing plant for Armstrong) with the manufacture date of 2/97. A further stamping, not yet indentified, is “M T” which may be the inspector stamping. The casing is made of brass, with the patina of age masking it original golden color. The case is currently in the private collection of Al Sumrall. Base diameter (including 1/4" rim): 7 5/8"
Base (not including 1/4" rim) OD 7 1/8"
Base bottom (inside) ID: 6 3/16"
Case thickness at mouth: 1/16"
Case thickness at base above rim ID: 1/2"
Graham, George E, Schley at Santiago. (Chicago: W. B. Conkey Company, 1902). Brassey, Thomas Allnutt, The Naval Annual 1893, Part 2, Pgs 358-360.